Changing the Font of Object Measurements: The measurement text font and font size of a selected object may be changed by single left clicking the Pick Font button. Resetting Rotated Objects: The orientation of an object that has been rotated can be reset by single left clicking on the Reset Object button. This will undo all rotations and will set the object back to its original orientation. This button can be used both on drawn shapes and items from the library. Objects that have been rotated on their axis can also be reset with this button. Editing Rotated Objects: Objects drawn in the Custom Shapes Stage that have been rotated on their axis may be edited with the Edit Object button. This button will temporarily rotate the object flat in 2D so that its shape may be edited. When the button is pressed again, the shape will revert back to its current rotation. Showing Measurements: To show measurements, check the Display Measurements box. To hide the measurements, uncheck the box. 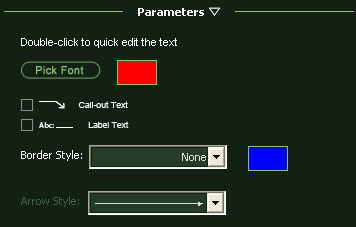 Callout Text: Selecting callout text will add an arrow to the text. With the move tool, the arrow may be adjusted to point to any location in the viewport. The center point of the arrow may also be adjusted to make it bend. The color of the arrow will be the same color as the text. 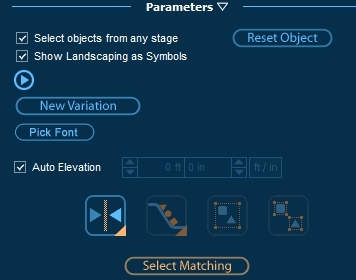 Showing Landscaping Items as Symbols: Items from the library may be shown in the 2D viewport either as 2D symbols or as 3D markers. 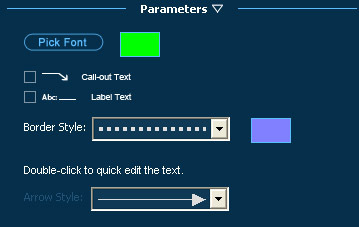 To switch between 2D symbols and 3D markers, you must select an object for the check box to appear. 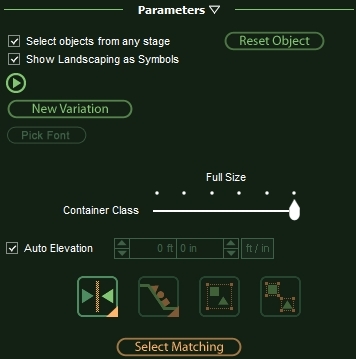 To see items as 2D symbols check the Show Landscaping as Symbols box. Uncheck the box to use 3D markers. New Variation: Pressing this button will change the selected tree or plant into a new variation. Using multiple variations creates a natural and realistic look. Please note, some plants and trees do not have this option. The Object Tools allow objects to be easily manipulated. The Objects Tools are Mirror, Alignment, Group, Ungroup. Center Horizontal: Selected objects will be centered horizontally. Center Vertical: Selected objects will be centered vertically. Space Horizontal: Selected objects will be evenly spaced on the horizon. Space Vertical: Selected objects will be evenly spaced on the vertical. Group: Selected objects will be grouped together. Groups are moved, rotated, scaled, and hidden as one. Selecting one object in the group will select the entire group. You may group objects from different stages and of different types. It is also possible to select multiple groups and group them together. The program will remember each individual group in the larger group and allow you to ungroup back into the smaller groups. By this process you may create a group composed of multiple layers of different groups. The Group tool also allows you to Weld incomplete line and arc segments into complete shapes. Please see Weld for more information. Most complete shapes and templates from the library are groups by default. Ungroup Selected group will be broken back into individual objects. If the group is composed of smaller groups it will be broken back into the smaller groups. The program remembers multiple levels of different groups allowing you to ungroup multiple times. Complete shapes may also be ungrouped, allowing you to adjust the lengths of the segments. Please see Weld for more information. Many templates from the library insert as groups by default and will need to be ungrouped before you can edit them or measure them with Object Properties.